I’ve read through it, and quite enjoyed seeing how The Black Hack was further hacked for the sake of Cosmic Horror. In The Cthulhu Hack, researching, recalling, and noticing things are handled using a Flashlights die. In the same way, chatting people up, persuasion, and interrogation are handled with a Smokes die. This metaphorically lines up with the illumination, and social misdirection that might go on during such adventures. I am a bit more literal, so would call them the Investigation die and Communication die though, or something along those lines. What’s great about it, no matter what they are called, is how the Usage die mechanic is used to make either a finite resource (you run out of ideas, or get fatigued) that can be replenished, and presents a form of risk, in that way. They have also done up a rather brilliant three page summary of Mythos. Using, by their own confession, totally out of context descriptions to frame incomprehensible intentions into something digestible, and workable for a new gamer, or someone that is just new to running games set in Cosmic Horror. Many worthwhile ideas, and the extraordinarily portable dice tray pictured below also seems worthy. 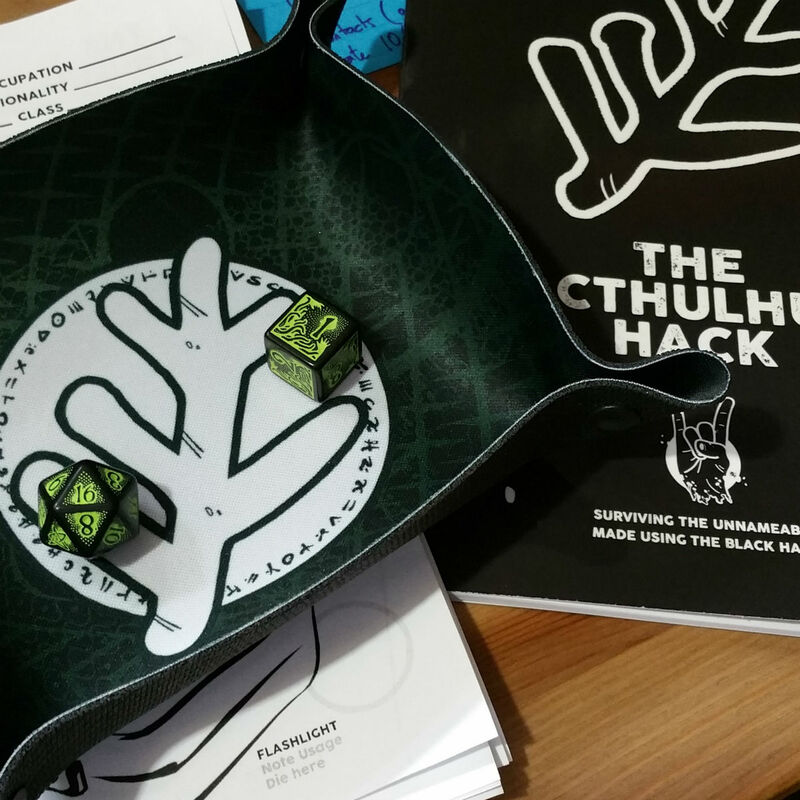 You can pick The Cthulhu Hack up on RPGNow or boxed through ENnie award nominated All Rolled Up.